Ohio State’s team of experts will work with you to determine the best treatment for your hand or arm, including ways to manage pain and improve function. An outpatient surgery may be needed to relieve pain and improve function. You and your doctor will decide whether surgery is right for you and what type of surgery may be best. For a simple fracture, a splint or cast may be used to protect the bone as it heals. Other fractures may need surgery. Closed reduction surgery, with internal fixation, uses pins or wires to hold the bone pieces together without making an incision. Some fractures need open reduction surgery where an incision is made to get to the bone pieces. Bone pieces are set in place and may be held together with pins, plates or screws. External fixation uses a frame on the outside of the hand that is attached with pins to the bone above and below the injury. Bone grafts may be needed if bone is missing or crushed. The bone graft may be taken from another part of your body. Carpal tunnel syndrome is caused by pressure on the median nerve of the wrist. Surgery to relieve carpal tunnel is always done as an outpatient procedure. The doctor will cut the ligament that crosses over the carpal tunnel to lessen pressure on the median nerve. Surgery may not ease all your symptoms. It may take three to four months to gain strength and normal use of the hand after surgery. Cubital tunnel syndrome is caused by pressure on the ulnar nerve at the elbow. The ulnar nerve goes down the arm and lies under the bone of the elbow, known as the funny bone. The nerve is right against the bone at that spot with little padding to protect it. Surgery to relieve cubital tunnel is often done as an outpatient procedure. The doctor may move the nerve to the front of the elbow or place it under more fat or muscle to protect it. Sometimes the bone is trimmed off to ease pressure on the nerve. Joint replacement surgery is removing a damaged joint and putting in a new one. Sometimes, the orthopedic surgeon will not remove the whole joint, but will only replace or fix the damaged parts. Arthritis in the thumb may be treated with outpatient surgery if other treatments have not helped. The doctor will make a small incision at your wrist. A bone at the base of the thumb, called the trapezium, is removed. A piece of your own tendon is used to put in place of the bone to form a false thumb joint. This allows movement of the thumb and stops pain because the bones are not rubbing together. While we start most patients with conservative treatment options, surgery might be needed. 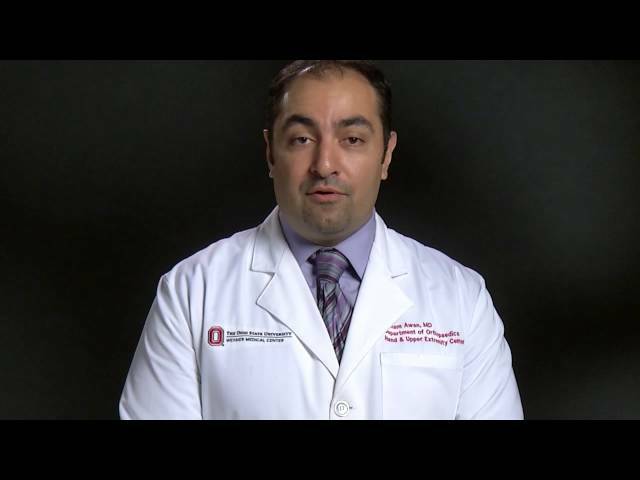 Hisham Awan, MD discusses what to expect in both the short and long-term. Kanu Goyal, MD, explains the benefits of the wide awake hand surgery approach, which can take as little as five minutes, including safety, convenience, cost savings and improved outcomes. 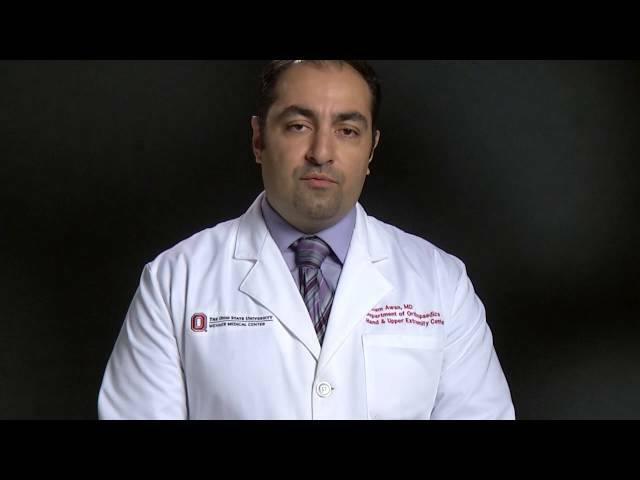 Hisham Awan, MD, explains how minimally invasive and arthroscopic surgery of the upper extremities minimize soft tissue damage and require smaller incisions.